Software testing is a labor-intensive, and hence expensive, yet heavily used technique to control quality. In this paper we introduce Gast, a fully automatic test tool. Properties about functions and datatypes can be expressed in first order logic. Gast automatically and systematically generates appropriate test data, evaluates the property for these values, and analyzes the test results. This makes it easier and cheaper to test software components. The distinguishing property of our system is that the test data are generated in a systematic and generic way using generic programming techniques. This implies that there is no need for the user to indicate how data should be generated. Moreover, duplicated tests are avoided, and for finite domains Gast is able to prove a property by testing it for all possible values. As an important side-effect, it also encourages stating formal properties of the software. K. Claessen, J. Hughes. QuickCheck: A lightweight Tool for Random Testing of Hasskell Programs. 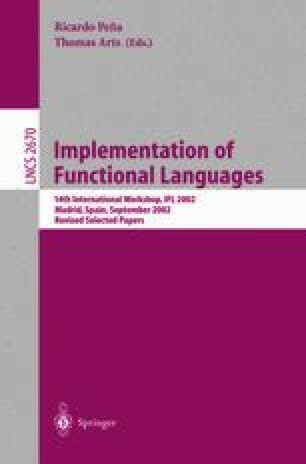 International Conference on Functional Programming, ACM, pp 268–279, 2000. See also http://www.cs.chalmers.se/~rjmh/QuickCheck. S. Peyton Jones, J. Hughes: Report on the programming language Haskell 98 — A Non-strict, Purely Functional Language, 2002 http://www.haskell.org/onlinereport. Rinus Plasmeijer and Marko van Eekelen: Concurrent Clean Language Report (version 2.0), 2002. http://www.cs.kun.nl/~clean. Maurice Siteur: Testing with tools-Sleep while you are working. See also http://www.siteur.myweb.nl.